Email info@scuola.us for placement tests if you need to a test in order to register for class. Most classes are currently held at the Ramona Building, downtown Portland area – 1542 NW 14th Ave, Portland, OR. The classes held at Expensify (401 SW 5th Ave) are noted below. La Scuola offers the Italian immersion classes for adults ages 13 and older. Scuola Italiana has adopted the CEF (Common European Framework) for structuring its adult language classes. Scuola Italiana adult language immersion classes are small, focused, and lessons are taught in Italian. Our New Beginner class is very popular and the class size averages around 15 students. As the classes advance, the classes become more focused and the average class size is six to nine students. The curriculum is flexible and tailored to meet the needs of students within each language level. At a cost of only $14 per hour, the Scuola’s Italian classes are affordable and highly effective for those who are serious in learning this beautiful language. While our class schedules follow the traditional school calendar with four terms, you are invited to enroll at any time. We will pro-rate your tuition and registration fees. Assessment testing is required to join ongoing classes above the beginner level. Email info@scuola.us for additional information. 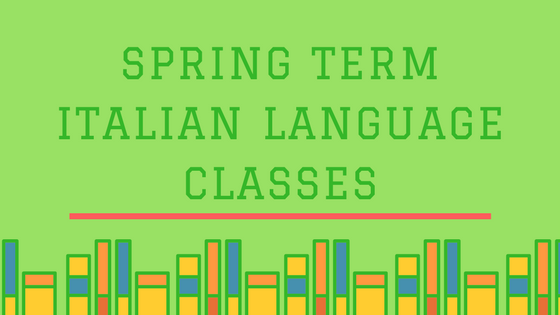 Whether you are planning a trip to Italy, learning the language for work, or simply embracing the beautiful Italian language and culture, our beginner classes will provide the framework that is necessary to communicate effectively in real life situations. New beginner classes are offered each term and there are usually ongoing classes at various stages of the beginner level for those who have some experience with the language. The best way to learn a language is by speaking it. In Beginning Italian, every student will speak the language starting the first day, from very simple phrases to more complex expressions as the term progresses. Our teaching approach at Scuola Italiana is communicative, which means we stress the importance of learning the Italian language in real life contexts and interactions. Grammar lessons are also included at this level of study as they provide a clearer understanding of the language and build the framework that allows students to grow in the language. Students entering the Intermediate level of Italian should be proficient in basic conversational Italian and have a solid comprehension of conditional and future tenses as well as present tense and past tense conjugations such as Passato, Prossimo and Imperfetto. At this level, students continue to develop their conversational skills and begin working on more advanced grammar rules. Students focus on refining their Italian language skills not only by studying the nuances of the language, but also by understanding the cultural context. Students collaborate as a class and in small groups to write short compositions on a variety of topics, which they will share and discuss among themselves. The classroom atmosphere is one of openness, where students work together and make mistakes together, all with the common goal of gaining fluency in Italian. Native-like fluency in Italian is only gained through regular and consistent use of the language. Students in Conversational Italian will receive many opportunities to speak and interpret the language through lively discussions about restaurants and food, current events, art and culture, music, and more. This course will also cover more Italian grammar, which facilitates reading, writing and speaking the language at a higher level. Grammar lessons may include: conjunctive forms, implicit forms, indirect speech, words alteration, and idiomatic forms. This class is designed to be flexible and is adapted to meet the needs of students who have a good command of the Italian language. Class structures and schedules may be subject to change based on enrollment. A minimum of four registered students is required for each class. If you or your child needs a class that is not listed, please be sure to let us know. We appreciate the opportunity to meet your needs! Are you a fan of music and have always wanted to compose? 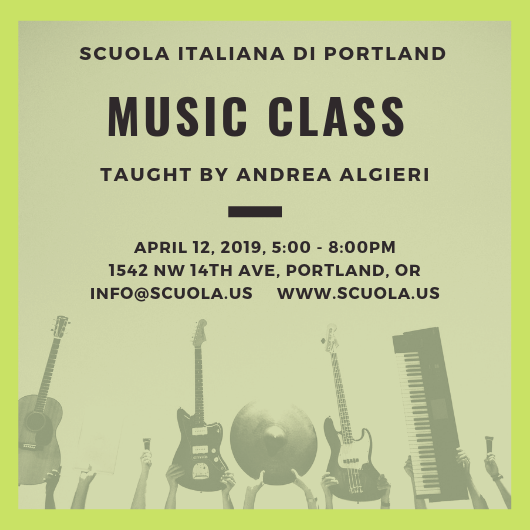 Join local Italian musician Andrea Algieri (bio below) for a three hour seminar that will focus on song composition. Andrea will bring his guitar and two different melodies – one upbeat and one melancholy. Students will be asked to cooperate in the writing of the lyrics, learning how to identify the different elements in which the text is divided, and work together to develop two original songs. The class is three hours long and open to teens and adults (age 13 and above). Some background in Italian is helpful, but beginners are welcome.